We always say that there are no bad characters, just bad writers. A character can languish for years before someone comes up with something interesting for them to do, but when that happens, it uncovers the potential that was there all along. Wanting his son to live the life of a mortal instead of under the rule of his father Zeus, Ares decided to raise his son on Earth instead of Olympus. While at work on a construction site, Ares was confronted by Ms. Marvel and Iron Man to register under the Superhuman Registration Act and offered a job as an Avenger. Ares agreed as long as they would match his hourly pay. Ares (Marvel's Ares - DC has their own, and he's a lot better-known) started out as a villain in the pages of Thor, and also caused trouble for Hercules over the years. In 2006, he had his own limited series which no one read, and it painted him in something more of a sympathetic light. Then in 2007, when Mighty Avengers spun out of Civil War, Ares finally became a major player in the Marvel Universe, a scant 41 years after his introduction. Okay, 40 years and 11 months. Precision counts. When Iron Man and Ms. Marvel were assembling their team, the reason they chose Ares was a simple one: it was like getting Thor and Wolverine in one. Unlike most Marvel Legends, this is the first time Ares has had an action figure. He never mattered enough before, so this is an inaugural offering. At last, the immortal god of war has been immortalized in plastic! 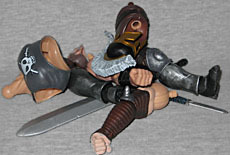 Ares is split among eight figures, but that's because one of them was just hauling around his accessories. He's really a seven-piece BAF: legs, arms, groin, chest and head. The main body fits together well, but man oh man, watch out for the head - getting it to pop in place is tough! 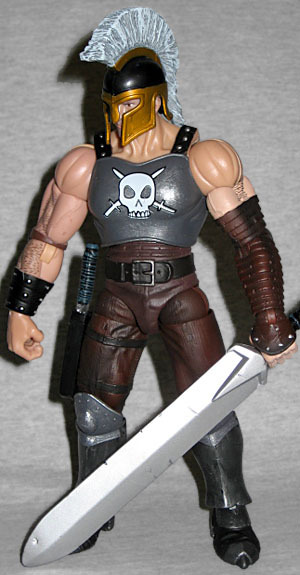 Although his artwork graced the Savage Land box set (and all the new 4" Marvel Universe cards), Ares is the first action figure specifically based on Frank Cho's art. Take a look at the concept designs that were shown off in Wizard magazine, and you can really see the connection. 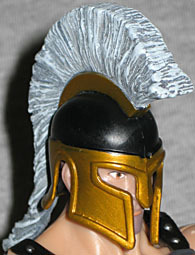 Ares stands a full 7" tall, but the crest on his helmet will take that up an additional ¾". The figure has balljointed ankles, hips, torso, wrists, elbows and shoulders, double-hinged knees, swivel thighs and biceps, and a ball-and-socket head. Sadly, the fact that the neck is a "true" balljoint actually limits the range of motion. Sure, he can look side to side easily, and tilt his head at a slight angle, but there's almost no up-down range. He's always going to be looking slightly down. The face is a good reproduction of Cho's art, and the paint is great: giving a toy a five o'clock shadow is tough, but Ares' looks just right. The war helmet is actually fitted so well that it clicks in place, and you can lift the toy by the crest on top without worrying about him falling. The sculpt is just as good here as it is on any other Marvel Legend. The armor on his chest and legs has a few scratches and dings, and the leather straps are cracked. His pants have wrinkles in the cloth, as well as a vaguely corduroy pattern. He has enough muscles to put He-Man to shame - check out that neck! The crest on his helmet looks like stiff hair, and the layered thing on his left arm is worn and uneven. Even his sword and dagger look like they've been used in battle. Ares' paint is excellent. We already talked about his stubble, but he has painted arm hair, too. The armor is dark with a lighter drybrushing to make it look like metal, and there are shadows on his clothes. 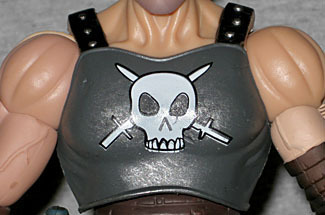 The skull symbol on his chest is clean, and outlined in black (though it doesn'tquite line up). Overall, it's a good presentation, and worth buying all the other Wal*Mart Legends if you want to complete your Mighty Avengers (or Dark Avengers) lineup.